Berlin-based Dark Electro legend Dance Or Die returns! On Nostradamnation, members Wagner and A.N.G.O. (joined by Chris L. from Agonoize live) combine dark atmospheres with massive beats, deep vocals, aggression and melody in the unique way that has become Dance Or Die's trademark. The group's sinister, dance floor-compatible visions of impending apocalypse stand out from the faceless crowd of bland carbon copies that make up the Electro scene. Nostradamnation marks the impressive return of a band that, in the Nineties, provided a link between the Gothic- and Electro-scenes like no other and whose unique fusion of styles left its distinct imprint on the club music of the time. Even now, two decades after the group's debut, Dance Or Die's sound is fresh, original and unmatched. The new album is released as a double CD containing a bonus disc with club-compatible remixes (by Solitary Experiments and Miss Construction, to name but a few) of some of the band's cult classics. Tracks like Psychoburbia and the seminal Dance Or Die, still mandatory spins at EBM clubs, are presented in altogether new light. 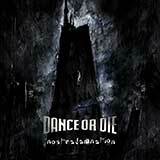 Dance Or Die has added 15 brand-new timeless classics on Nostradamnation. Dance the Apocalypse, baby!